The Seattle Times has collected hundreds of reader responses to the tax hike. Many who said they’re retired or disabled, and living on fixed incomes, offered emotional stories of being unable to afford the heftier rate. Dennis Hall imagined living his whole life in the country-style home he and his wife built in Kirkland for $55,000 in 1980. But the couple, now retirees on a fixed income, say the latest tax bill for their property — valued at $1.2 million — is forcing them to rethink their golden years, sell the beloved home and move. 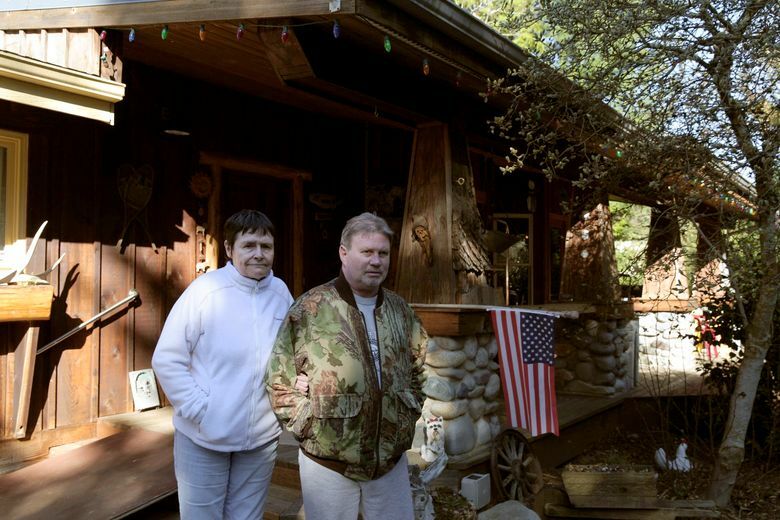 With this round of property-tax notices, the couple are not alone in their worries. As the effects of the higher rates spread statewide, some homeowners are calling the tax increase a tipping point in a period of financial stress that’s forcing too-soon goodbyes to longtime homes. Over the course of weeks, The Seattle Times collected hundreds of emails, phone calls and responses on social media from people like Hall, many of whom identified as retired or disabled, saying they have limited options for paying the heftier amounts. “Should anything happen to me like an illness or injury, I will be homeless pretty quick,” wrote a 61-year-old homeowner in Seattle’s Ballard neighborhood. The property-tax increases vary greatly from city to city. A handful of people shared less emotional stories of budgeting without lattes or expansive cable packages to cover the larger bills. 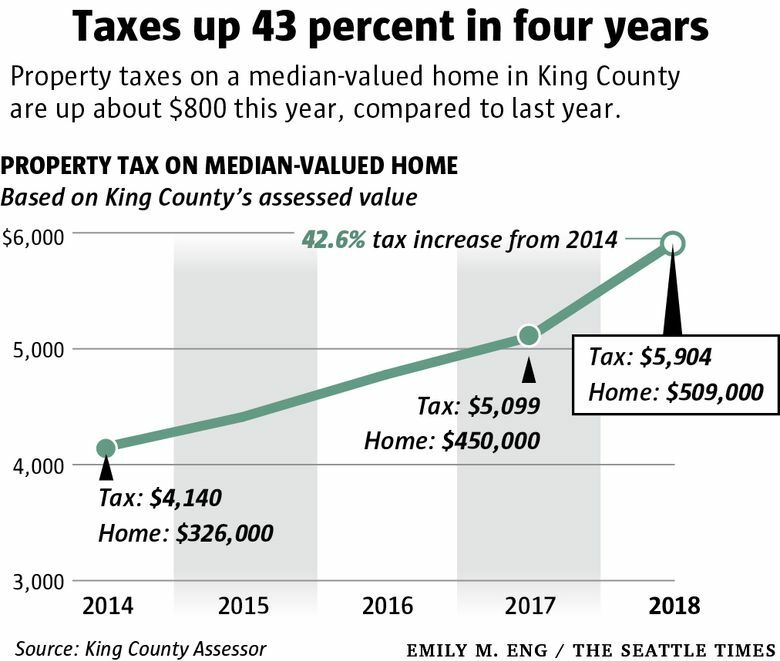 A few said the spike is a result of Washington’s regressive tax structure. And in a region with a growing housing- affordability and homelessness crisis, a couple of respondents acknowledged their status as “well-paid” and fortunate enough to afford the tax by simply shifting around their spending. With Social Security, some seniors hoping to qualify for assistance reported annual incomes that barely surpass the state’s maximum of $45,000 for tax deferrals or $40,000 for exemptions. Recipients of the former eventually have to repay with interest, while tax exemptions reduce amounts due based on various criteria, including income and home value. According to numbers provided by the Washington State Department of Revenue, about 107,000 seniors participated in the exemption program last year — or roughly 7 percent of the state’s total senior population. The department, meanwhile, received 558 applications for deferrals. Surrounded by spacious fields and livestock, the Kirkland home was ideal for Hall and his wife, Patricia, to settle down in and raise a family, with college and the military behind them. Born and raised in the suburb, he worked in construction while she managed the home. They adopted a baby girl in 1985. “That’s when the house came alive,” he recalled. Nearly four decades later, a time span that included the birth of their grandson, the couple’s budget tightened significantly when he retired in 2010 at age 58. The latest tax increase of $1,500 on the property — not far from Microsoft’s campus — hit hard. They sold the land and home to a local developer soon after and started making plans to move to the Duvall area, where their daughter’s family lives. “I’m not against paying taxes,” Dennis Hall said, so long as the government services he sees are on par with how much he pays. These days, relocating for more affordable living is not a phenomenon unique to Washington retirees. New U.S. census data show populations of retiree-friendly communities rising faster than national population growth, The Wall Street Journal reports. But the shift for homeowners here, in the metropolitan area of King, Snohomish and Pierce counties, comes with incomparable pressure. Single-family-home values in the three counties have been rising faster than anywhere else in the country. Median house prices recently hit records of $777,000 in Seattle and $950,000 on the Eastside. 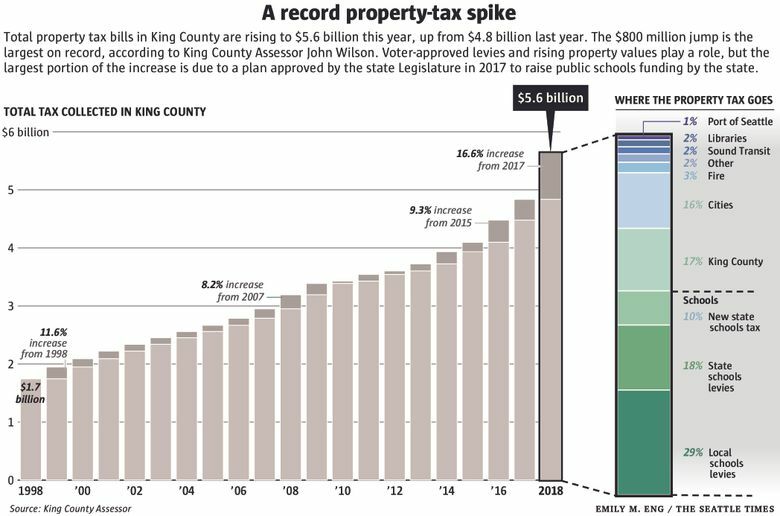 Beyond the surging values, this year’s property-tax increases are largely a result of last year’s bipartisan deal by lawmakers to shift spending on public schools. 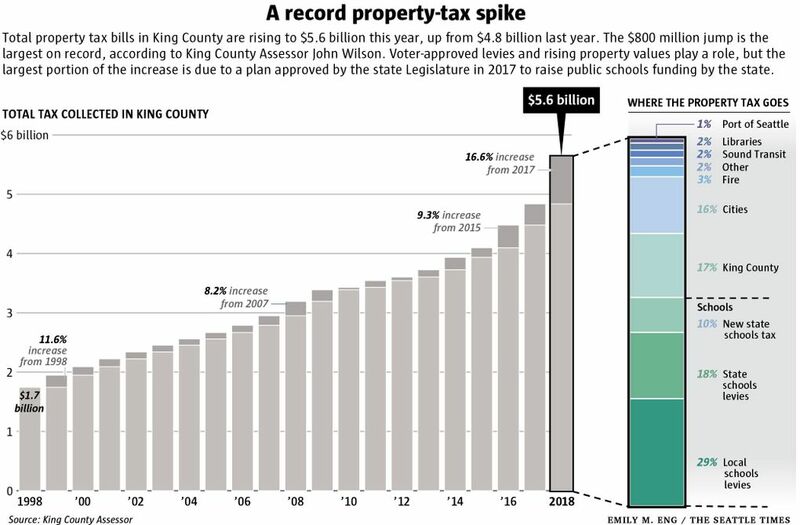 In an effort to comply with the state Supreme Court’s 2012 McCleary ruling, which found the state has neglected its constitutional duty to pay for public schooling, lawmakers voted to raise the state property-tax levy for schools to $2.70 per $1,000 of assessed value, up from $1.89 in 2017. The plan will reduce local school levies, but not until next year. “Wondering if ‘laptops for kids’ is worth losing homeowners,” a Bothell reader wrote to the newspaper, saying her family picked the city in 2009 because of its lower taxes compared with the Seattle area. Michelle LeMay, 64, of Seattle, knows the effects of property taxes well. She worked almost two decades in the King County Assessor’s Office as an administrative specialist, mailing tax notices to homeowners, fielding phone calls and helping people such as seniors with exemption paperwork. But the tables have turned. Now, she and her husband, on a fixed income, feel they’re being pushed out of their house in Greenwood with this year’s property-tax increase of 22 percent. 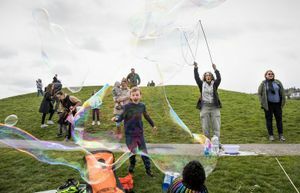 In many poorer and rural school districts across Washington, projections for the new law on school spending show cuts in property taxes in future years, while taxes remain higher in richer areas like Seattle, Bellevue and Mercer Island. Voter-approved levies make up a large portion of the hikes in some areas, too, including King County, where the increases range from 9 percent in Normandy Park to 31 percent in Carnation. Among U.S. states, a 2016 report by the Tax Foundation found Washington had the 26th-highest property-tax rate (0.94 percent). That compared with the highest rate of 2.11 percent in New Jersey. It’s unclear how the new taxes may change Washington’s rank. 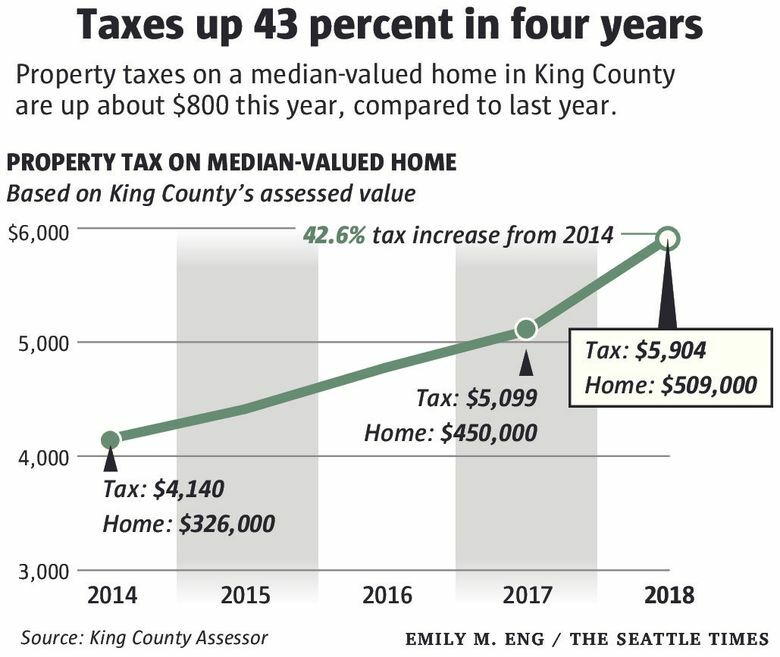 As LeMay and her husband go through their belongings and contemplate selling their home eventually, they told The Times they feel overwhelmed and are looking at possibilities outside King County. “Arizona seems like the place a lot of people are relocating,” LeMay said. Beyond tax exemptions and deferrals for qualified seniors, widows and people with low incomes or disabilities can apply through the state for tax help. Also, homeowners can appeal the assessor’s valuation of their homes, which determines tax increases, by July 1 or within 60 days of receiving notification of their assessment. Kathleen Dellplain, 72, formerly of Seattle’s Fauntleroy neighborhood, moved away before the pack. A retired widow, she noticed herself losing financial ground as the owner of a waterfront home years ago. She put the house on the market after receiving this year’s assessment and moved to a farmhouse in Enumclaw, in Southeast King County. “If I could’ve frozen my tax or kept it with the regular rate of inflation, I would have probably stayed there for the rest of my life,” she said. But costs rose too quickly for her income, she said, especially with her commitment to help grandkids through college.